Cinder and Captain Thorne are on the run in a stolen spaceship, and they have teamed up with Scarlet and Wolf in order to overthrow Queen Levana. In order to do this, they must seek help from Cress, a girl who has been imprisoned on a satellite since she was a child. Cress is an excellent computer hacker because she has had nothing and nobody but her netscreens the entire time she has been imprisoned. The problem is that Cress has just received orders to track down Cinder and her accomplices for Queen Levana. I had highly anticipated the released of this book and I am pleased to say that it was well worth the wait! Each book in this series gets better and better, and Cress definitely did not disappoint. In this book we meet Cress, who is basically Rapunzel but instead of being imprisoned in a tower she is on a satellite orbiting Earth. Her social skills are a bit lacking because she has been imprisoned alone for so many years, but for a girl who has spent so much time alone she is very bright and strong. When Cinder and her group attempt to rescue Cress from the satellite so that she can help their team, they run into trouble and the group ends up separated. Cress is finally free of her prison but is now lost along with Captain Thorne, and the Cinder must do everything in her power to stop Queen Levana from marrying Emperor Kai. I love the way each of these books focuses on a new character each time but still allows us to see what is happening to the other characters as well. Cress is a great new character and at first seems so childlike and innocent because she has been alone for so long but I like how she is able to become strong and hold her own. I also love the way the relationships between the other characters are still developing three books later and it doesn’t feel like anything between them has been dragged out or fallen flat. Meyer does an excellent job of keeping the story going and keeping the relationships interesting. Overall, Cress was an excellent and exciting follow up to Scarlet and Cinder. This book definitely had an interesting ending so I am very anxious to see what happens next! 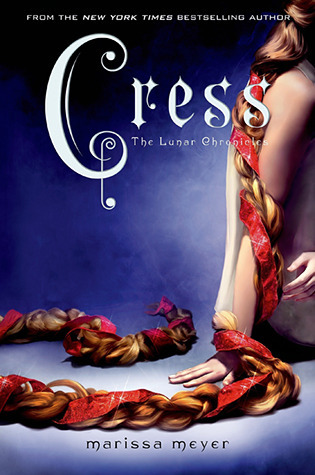 Cress was released on February 4, 2014 and is the third book in The Lunar Chronicles.